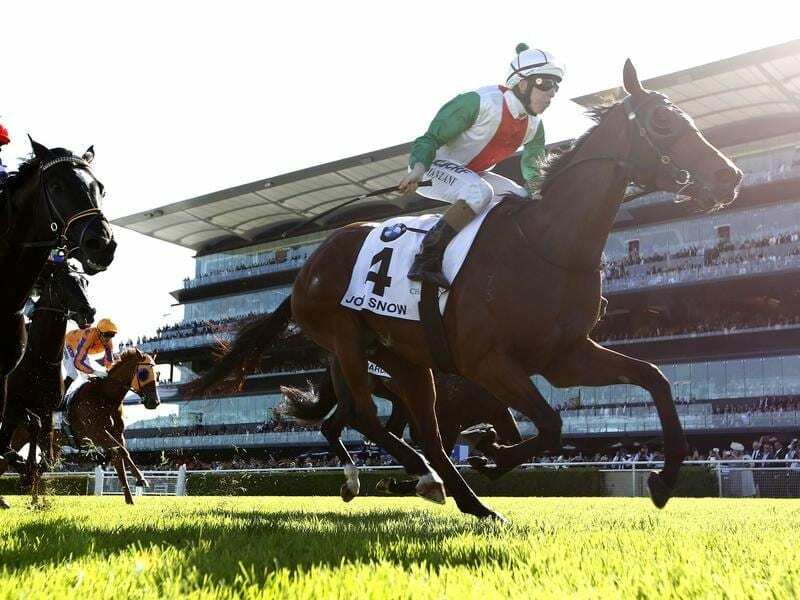 New Zealander Jon Snow will head to Melbourne on a Group One spring campaign. Last year’s Australian Derby winner Jon Snow is on track for another Melbourne spring campaign after delighting his connections in his season return in New Zealand. The Murray Baker and Andrew Forsman-trained Jon Snow finished fourth in Saturday’s Group One Tarzino Trophy (1400m) at Hastings, won by Melody Belle, in his first start since last year’s Melbourne spring carnival. Forsman said Jon Snow was likely to travel across to Melbourne on Sunday and was scheduled to start his Melbourne campaign in Saturday week’s Group One Makybe Diva Stakes (1600m) at Flemington. Stephen Baster, who rode the horse in his five Melbourne starts last spring, will be reunited with the stayer in the Makybe Diva Stakes. “We were rapt with his run on Saturday,” Forsman said. “It was a great run for a horse who hasn’t raced for 10 months. “To be only a length-and-a-half or so off those sprinters, it’s good for a staying horse. Jon Snow missed last year’s Melbourne Cup when he failed a fitness test three days earlier. The first of Baker and Forsman’s Melbourne spring carnival hopefuls arrived in Melbourne on Sunday, with star mare Bonneval joined by three-year-old filly Rubira. Bonneval is set to begin her spring campaign in Saturday’s Group Two Dato Tan Chin Nam Stakes (1600m) at Moonee Valley, a race she won last year.